Remember last year's recall of 3.8 million Toyotas for floor mats that may cause fiery death? Guess what? Toyota's announcing it's recalling another 1.1. million for the same reason. Time to whip out the fiery death avoidance flow chart again. Keep in mind this recall is different than the recall last week of 2.3 million cars for sticky accelerators. This is an expansion of the recall on Toyota and Lexus models with the potential for pedal entrapment under floor mats. The increase means Toyota has recalled 5.35 million vehicles in the probe, agreeing to use zip ties (to a somewhat ghastly effect), repair or replace the pedals, replace the floor mats and in some cases will make software modifications and reshape the floor surface. 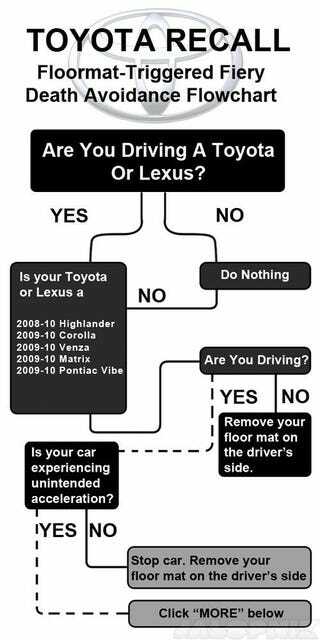 So, for those of you who didn't know before today that your floor mats were trying to kill you, we've attached our special Floor Mat Fiery Death Avoidance Flow Chart for your safety. Read the rest of our How To" here and remember, the information on it comes directly from Toyota — so you know it's safe.